Every day, hundreds of millions of photos are uploaded online, eventually settling into their own little corner of the web. But Google has now awakened millions of those images, using them to stitch together incredible time-lapses of famous landmarks. Time-lapse images have taken us on beautiful journeys in the past, and the best ones have likely found their way to your Facebook or Twitter feed. However, a standard time-lapse requires a photographer to park themselves in the same spot for quite some time, recording slow changes in the landscape. Needless to say, it's a task that requires patience. But researchers from Google and the University of Washington found a way to sidestep that requirement, managing to create breathtaking time-lapses without leaving the comfort of their own lab – and the result was pretty awesome. "Whereas before it took months or years to create one such time-lapse, [with our algorithms] we can now almost instantly create thousands of time-lapses covering the most popular places on Earth,” Ricardo Martin-Brualla, David Gallup, and Steven M. Seitz, who were involved in the project, wrote in a paper documenting their work. That ‘time-lapse mining’ resulted in a sort of patchwork quilt of images taken by people all across the globe. The memories of strangers were stitched together with one another to make a whole story, resulting in an artistic and educational documentation of the ever-changing world around us. The researchers then built custom-made algorithms to automate the process and make the differing camera angles unnoticeable when viewed in sequence. A stabilization process compensated for changes in lighting that would have typically resulted in flickering between frames. The end product was more than 10,000 time-lapse sequences of 2,942 landmarks, each consisting of more than 300 images. From California to Croatia, they include some of the most photographed landscapes and landmarks in the world. They show seasonal patterns in San Francisco, building renovations in Germany and monument excavations in Cambodia – and that's just the beginning. Some of the time-lapses, such as the construction of the Goldman Sachs Tower in New York, show the achievements of modern-day architecture. Others, including the shrinking of Norway's Briksdalsbreen Glacier, shed light on the climate change debate. 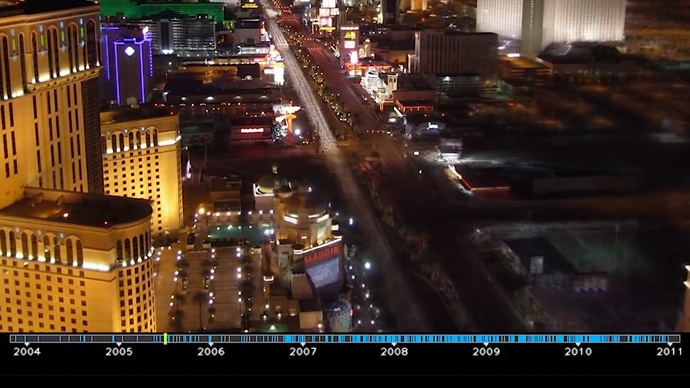 Geological changes are shown in a time-lapse of Yellowstone National Park's Mammoth Hot Springs, while the changing rhythm of Sin City is displayed in a time-lapse of the famous Las Vegas Strip. Additionally, the famous Wall Street Bull was actually found to have moved slightly over the years, resulting in time-lapse blurring. Looking ahead and learning from their errors, the researchers say the time-lapse technology creates “a new paradigm for visualizing global change” and is the beginning of something even bigger. “As more photos become available online, mined time-lapses will visualize even longer time periods, showing more drastic changes [than the ones already assembled],” they explained.